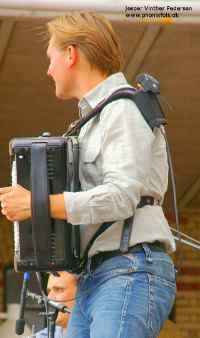 Below the treble cover Eskil Rommes accordion hiding one of our older systems (1989) and a midi system - therefore the many wires. The lead from Karens instrument is barely discernible in all black. Jesper from phonixfolk.dk has the freedom to move due to his sonus.dk wireless stereo-system. 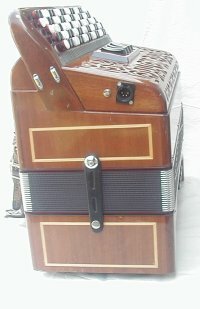 When you want to amplify an acoustic instrument it is often a dream that it "just has to be higher" - ie an amplification of sound power without coloring the sound and otherwise entirely without problems, feedback or noise. This dream we share fully, it's just hard (impossible ?. ..) to meet in the real world where laws of nature as we know rules. Below are some of the challenges the job provides and how we have sought to meet them. How to avoid acoustic feedback ("howling")? This phenomenon sets an upper limit on how much you can amplify an acoustic instrument . 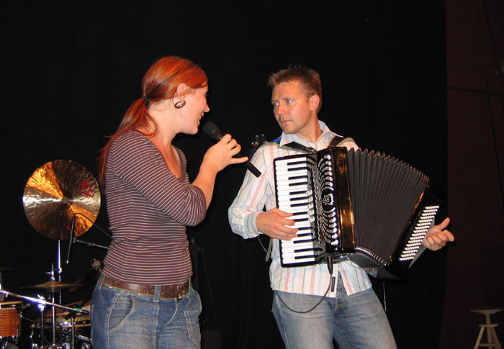 There are more possible solutions: you can get the audience to remain calm - you can play louder on the instrument - or you can go closer to the microphone. 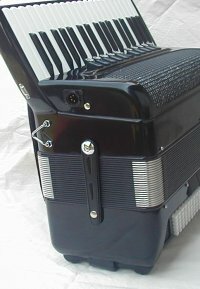 Our solution relies on to go so close as possible to the sound source, that means: indside the accordion near to its reeds. The closer you go the sound-source (the reeds) the bigger is the difference in the soundlevel received from the nearest reed and the the others. Since we have chosen to go as close to the sound source as possible we have a problem. The solution to this is: Many microphones, ideally one for each reed. We have after countless attempts to come up with 6-8 microphones in the treble and 2-3 in the bass works well and that little is gained by using more. 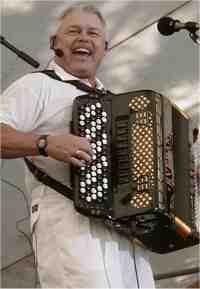 How does an accordion sound ? Is the "correct" sound what you hear 1 meter or 5 meters in front ? or 10 cm behind? Or as in our system: inside the instrument ? 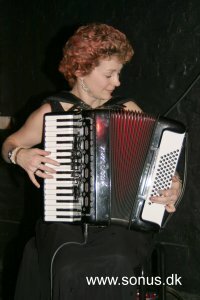 Anyone can make sure that the sound of an accordion changes by moving around a harmonica being played - especially in near field (0 - 100 cm) there are large fluctuations. 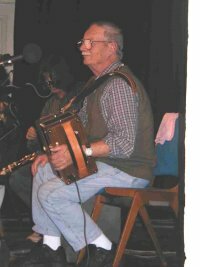 From interviews with many experienced soundengineers we know that they usually put their tone controls at neutral, taht there is plenty of signal and that they have not experienced any system for amplification of accordions which were easier to have to do in PA contexts. Many musicians have used our microphone system in study contexts - often in a mix with a studio microphone. What about the sound when playing full-power on the instrument? How is the system powered ? 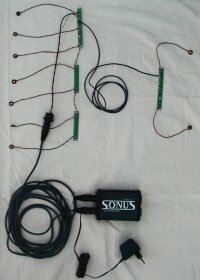 The electronics is powered from an external transformer or DC power supply. The floor box has a built in rectifier and stabilizing circuit which makes the system uncritical concerning choice of power source. This allows the system to be used all over the world. An appropriate transformer / power supply could be purchased locally for a song (in case of emergency, one or two 9 V batteries can be used). 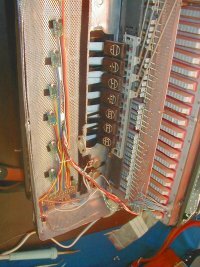 By replacing the integrated circuit in the floor box and optimize the whole system we have succeeded in bringing power consumption down so that the system can be powered from a mixing consoles phantom supply, thereby avoiding the power supply on the scene. 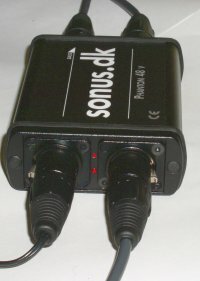 Can a sonus.dk - system go wireless ? Yes, this have been an demand from day one. We can provide a belt-box with built-in battery, and we can help with info on suppliers of wireless systems and remedies that may be needed to get optimal results. Take a look on this video with phonixfolk.dk the sound quality is much better than on most youtube-videos. 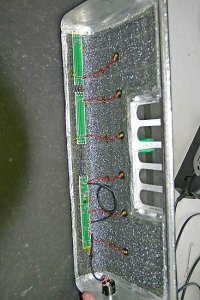 Floor box with everything connected - note the two LEDs which can be very helpfull when troubleshooting.